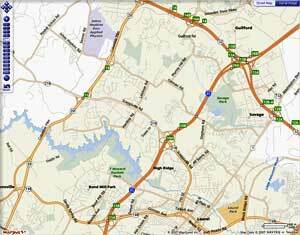 This is the preferred region and is mostly situated in southern areas of Howard County, Maryland. It does extends south into Prince George's County and south west into Montgomery County but these areas are south of the Reservoir and are more likely to be developed. 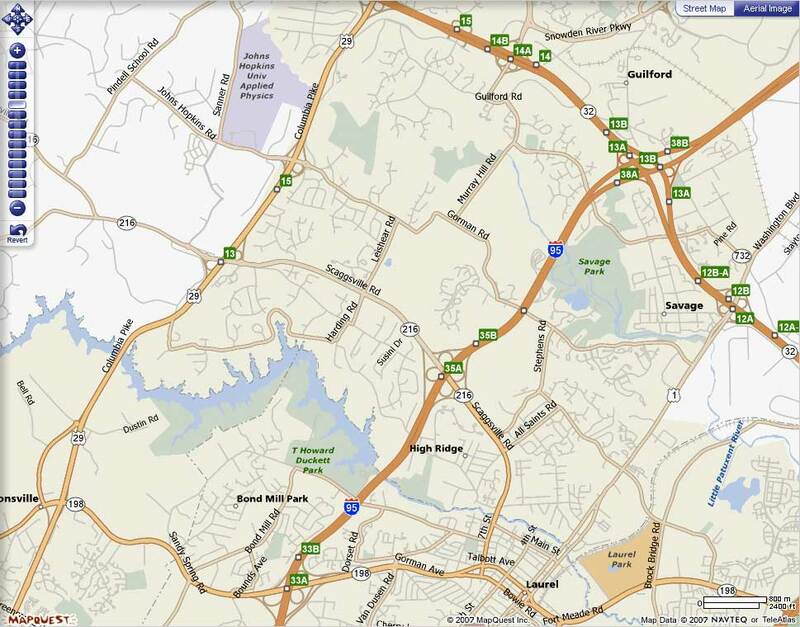 This area is bordered to the East by Interstate 95, nearly bisected along its western border from North to South by Columbia Pike / Route 29, bordered to the North by Scaggsville Road / Route 216, and to the South to Spencerville Road / Route 198. Right: Map of the region that contains the areas of prime interest for locating the Observatory. Click on image to see enlarged view. For all the shortcomings from an academic viewpoint this is about as good as it gets for placing this telescope in the Baltimore-Washington, D.C. corridor for its intended purpose. We have learned that the 'best telescope is the one that gets used'. Any observatory that is sited remotely - yes even a superb instrument placed in the dark skies of Arizona - can not be so convenient that it will attract scores of students. PROS: This area is not highly developed (yet) and can be reasonably dark. While the areas bordering the north of the Rocky Gorge reservoir are particularly attractive since they overlook steady, protected areas. And the entire region is very easy to access by schools from several major arteries. The topography and atmospheric qualities of the area lend themselves well to high magnification observing with some exceptional nights throughout the year. Viewing a planet from this area can be better than most locations is dark but mountainous areas (Colorado, etc.). The area just to the south edge of the Reservoir is already occupied mostly by established communities with single family dwellings, and so we do not envision any dramatic decline of the skies in this direction. Most areas in Prince Georges and Montgomery Counties do not seem to miss seeing their night sky. But some communities in Howard County have regulations that historically limited signs and other lighting, particularly in Columbia a planned community envisioned largely by the late Jim Rouse. Infrastructure is good with choices of high speed Internet access in place by Comcast Cable, and coming gradually by Verizon Fiber Optic. Howard County government has done a good if somewhat unbalanced job of providing good educational opportunities for primary and secondary school students. This area has among the newest and best equipped public and private schools too, with many students interested in the sciences. CONS: The shortcoming of the region involve the diminishing transparency of the night sky, this is making it harder and harder to see and image faint 'deep sky' objects since they are not as often contrasted against a clear black sky. Columbia is the largest community in the area, located to the north of our area of interest. If Columbia were a city, then it would be the second largest in Maryland and yet it has retained a peaceful and unobtrusive skyline, and it had a reasonable balance of development and open spaces. However, we observe a decline in the quality of life in eastern Howard County over recent years. One can now experience parking lot traffic on Route 29 over the rush hours, Ryland Corporation turning farm fields into crowded clusters of monotonous 'detached Town Houses' - with some roads so narrow that parking is problematic. With the acquisition of the Rouse Company assets by General Growth Inc. we see little to cheer about. New 'Big Box' shopping centers opening with their associated wasted lighting, a twenty-two story high rise for the heart of Columbia, and other signs of insensitive greed and future aspirations that will probably similarly be inflicted upon the community unchecked. We worry about this heading south into the country of Howard County. In light of the recent droughts and orders by local Governments for residents to reduce water uses, the pace of new development and congestion may gradually retard as infrastructure does not seem to to be able to keep up with the growth. We are little amused for example to hear the State of Georgia cry to the Federal Government about lack of water all while Atlanta's infamous suburban sprawl grows by leaps and bounds using up the resources; ditto for Las Vegas and many other cities. Most of the worst problems for an observatory in Howard County are located in areas up to the North of where we envision siting the Observatory. This portion of the sky is our least significant exposure in terms of visual astronomy. There are brightly illuminated baseball and tennis fields to the north of Columbia in Centennial Park. And just east of Route 29 between Rt. 216 and the reservoir there is an illuminated golf driving range, so we would hope to locate south of that or far enough to either side of it that this will not be a major problem. We can only hope this comparatively large telescope can overcome these adversities in the present and near future with its sheer light gathering power. And with improved CCD imaging systems, then we will see more of the night sky - as much as we dislike encouraging students to spend even more time on a computer panel even it if is to observe the sky. 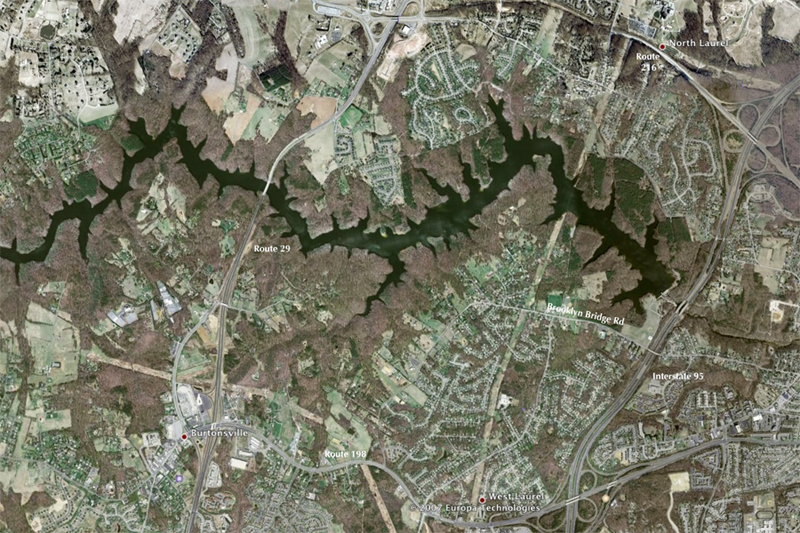 Above: Aerial view of the Rocky Gorge Reservoir area. This is our primary area of interest for locating the Observatory. For the time being feel free to contact us through Company Seven with any questions or suggestions.